Imagine a land of marvels, where every journey in space is also a trip back in time. When you come with us to Peru, you’ll experience this magical time warp, reliving the glories of the Inca Empire, the age of the Spanish conquistadors, and the indigenous centuries that precede both. Your Peruvian adventure will take you high in the Andes: to Titicaca, Earth’s highest navigable lake, and to the Incas’ legendary mountain capital of Cuzco. But you’ll go in comfort, with luxury train rides and a cuisine regarded by foodies as one of the world’s best. Best of all, whether it be the forest-clad peaks of Machu Picchu or the mammoth Inca fortresses of the Sacred Valley, you’ll have with you expert guides whose passion and professionalism bring an entire vanished world to life. Travelers to Peru typically describe their experiences as life-changing. Learn why when you come with us to this enchanted, spiritual place. Why go with us? Because all our Peru tours are fully customizable to fit your needs and trip duration. The itinerary below runs 12 days, but if you want to change or personalize, just ask! After a long international flight, we’ll meet you at the airport in Lima and take you to your hotel – either at the airport or in central Miraflores. We recommend a day to see Lima and decompress from your international flight. Choose from a city tour including visits to its grand colonial plaza, catacomb-filled churches, and pre-Colombian museums, a market visit and cooking class, or visit a traditional fishing village. 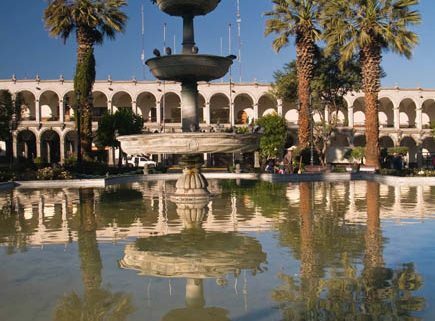 Today we’ll bring you the airport for your flights to Arequipa – perhaps Peru’s nicest looking city. Although you will be exposed to altitude here – 7,700 feet (2,350 meters) above sea level – it is not as high as Cusco, allowing for easier acclimatization. We’ll bring you from the airport to your hotel, and then for a brief tour of this special colonial gem. 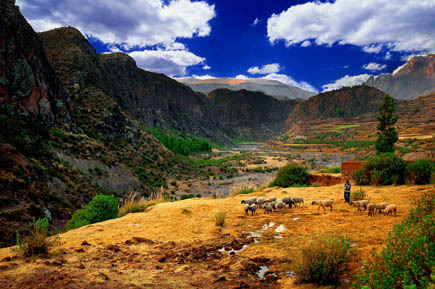 We’ll bring you to join a small group for a tour of the Colca Canyon – reputed to be the deepest in the world. You will pass through some quite high altitudes along the way, so take it easy during your stops along the way. Hopefully you see some vicunas in the hills. The local town of Chivay, where you are likely to stay, has some fabulous hot springs as well. Don’t forget your swimming gear! 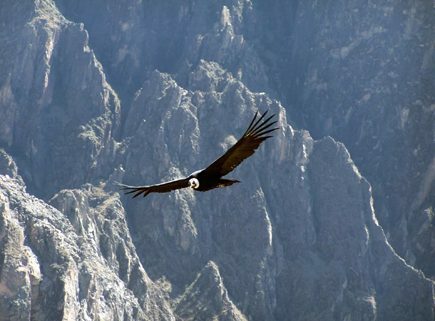 Among other wildlife, this is one of the best places to see the Andean Condor – the largest bird of prey on the planet. After exploring Colca Canyon a bit more, you’ll be brought to Puno, the Peruvian city nearest to Lake Titicaca. This will be the highest point on your trip – 12,500 feet (3,800 meters) above sea level – so take it easy walking until you feel you’re adjusted. 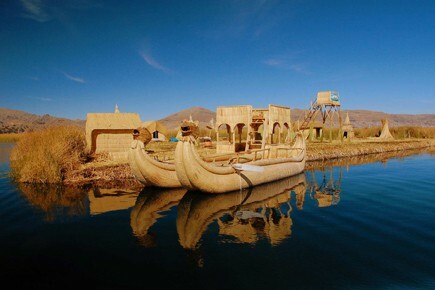 Considered the birthplace of the Inca and with modern remnants of Aymara cultures, Lake Titicaca is a quite special place. Furthermore, it’s the largest navigable lake in the world! You can find many local people living here in more ancient ways, including on reed Islands. You’ll see some on your tour! Today you’ll board a first-class bus across the Andres from Puno – Cusco. This is an excellent, quality, safe guided bus, which brings you across spectacular landscapes, stops in a local village, as well as ancient Inca ruins complexes. You’ll end the day in Cusco and your hotel there. Today you can join a small group for a half-day tour of Cusco – the ancient center of the Inca universe. The Cusco cathedral and central Plaza de Armas are special in their own right. And the visits to the Q’oricancha (Temple of the Sun) and Sacsayhuaman make it even more worthwhile. 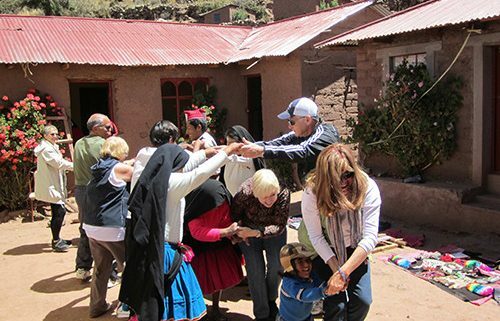 Today you’ll join a small group or private vehicle for a full-day tour of the Sacred Valley of the Incas, accompanied by a professional, English-speaking guide. 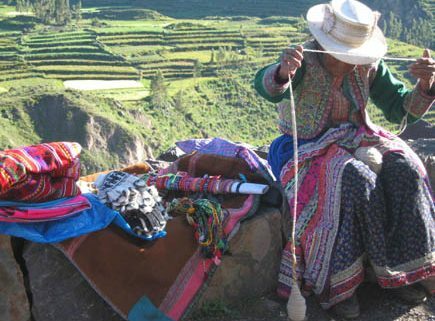 You’ll have the chance to visit the markets at Pisac – the most famous in the Valley – with wares from local vendors, and if there’s time, the ruins above the town. With a lunch break included, you’ll also visit the village and ruins of Ollantaytambo – a special Inca fortress with a unique history … and the departing point for trains to Machu Picchu. In the morning you’ll travel to Machu Picchu, looking out your train window at the nearby peaks and fast-flowing waters of the Sacred Valley before arriving in the town of Machu Picchu – where your guide awaits. You should have time to drop your small bag at your hotel, before heading up on the bus up to the entrance of ancient Inca Citadel. After a guided tour of these incredible ruins – unique in so many ways, you should have some time to explore the site more at leisure—taking photos, scaling the surrounding slopes, or sitting in quiet contemplation. Watching day break over Machu Picchu is on everyone’s bucket list, and you’ll experience it with us. You can also choose to walk to the Inca Sun Gate or climb the shark’s-fin sugarloaf of Huayna Picchu before lunch and your return to Cuzco and your hotel there. After perhaps a morning free in Cusco to explore a bit more on your own – just walk around the Plaza de Armas, visit the Inka or Chocolate Museums – we’ll bring you to the airport for your flights home, via Lima … and unforgettable trip!